Moscow's literati delved into the saga of the publication of "Doctor Zhivago" and bemoaned the low salaries of translators. Looking back at Moscow's recent literary events, two stand out. The first was a public lecture given on Dec. 14 by the literary scholar and Radio Liberty presenter Ivan Tolstoy. His topic was the first Russian publication of Boris Pasternak's "Doctor Zhivago." As Tolstoy told it, this was a real mystery story, rich in conspiracies and controversy. Pasternak's novel was banned in the Soviet Union, and the author agreed to the publication of an Italian translation in the West. However, the novel could not be considered for the Nobel Prize in Literature unless there was a publication in the original language. Respectable publishing houses were reluctant to proceed, wary of complications with the Soviet authorities. In the end the publication was sponsored and organized by the CIA. The story featured double agents, an embittered Italian publisher and a mysterious airplane stopover in Malta so that the CIA operatives could photocopy the manuscript. The novel was printed in Holland just in time for the Nobel Committee to receive the copies. Tolstoy's lecture attracted many literary luminaries, including the lecturer's sister, the writer Tatyana Tolstaya. Another memorable event took place last Monday, when the Guild of Translators convened to discuss the state of the profession. Vladimir Babkov, one of the best translators working today, presented a very gloomy picture. While he is acclaimed for translations of authors such as Julian Barnes and Ian McEwan, Babkov complained that literary translators are overworked and tragically underpaid. Another well-known figure, Olga Drobot, pointed out that Norwegian translators have gone on strike several times to draw public attention to their plight. Some participants offered a less depressing outlook. Irina Alexeyeva presented a study showing that children read quite a lot of translated fiction, and not just the Harry Potter books. Elena Kostjukovic, the translator of Umberto Eco and a professor at the University of Milan, suggested the idea of organizing informal groups of intellectuals who could wield influence due to their standing in the community. Finally, a group of students from Moscow State University presented their work-in-progress: an anthology of Victorian mystery writing. This collection of short stories never published in Russian highlights the emergence of the detective story, showing that Sherlock Holmes was not alone in his endeavors. The enthusiasm of the young translators was so obvious that it helped some of their more experienced colleagues to reconsider their pessimistic views. 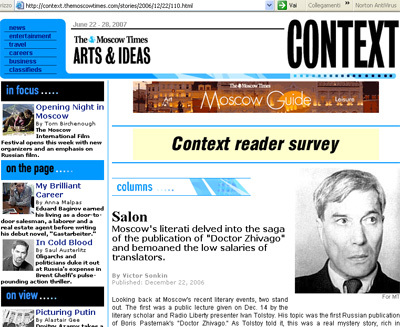 Copyright © 2006 The Moscow Times. All rights reserved.